Carson Wentz enters the 2017 season as the unquestioned starter, unlike last training camp, when he was QB3. On July 24, there will be football again, as quarterbacks, rookies, and select veterans will report for training camp. Leading up to camp, we'll be taking a look at each positional group, starting with the quarterbacks. Obviously, Wentz is the unquestioned starter heading into 2017, unlike last year when he entered training camp as QB3. Most NFL people see that as an advantage to the quarterback, knowing that he is 'the man,' as long as the player has the temperament to handle it, which Wentz seemingly does. As for Wentz's skill set, about midway through camp a season ago, it was very clear (to me, anyway) what Wentz's strengths and weaknesses were. Seriously, go read this. Sometimes training camp can provide false reads of players. That was not the case with Wentz. His positive and negative traits were easily identifiable. Everything we saw in camp carried over into the regular season. In his rookie season in the NFL, Wentz did a lot of encouraging things. He showed arm strength, mobility, toughness, leadership qualities, and smarts. That's a good start. However, one of the most important traits for an NFL quarterback, accuracy, was an issue at times. More specifically, Wentz had a propensity to sail passes over the heads of his receivers. 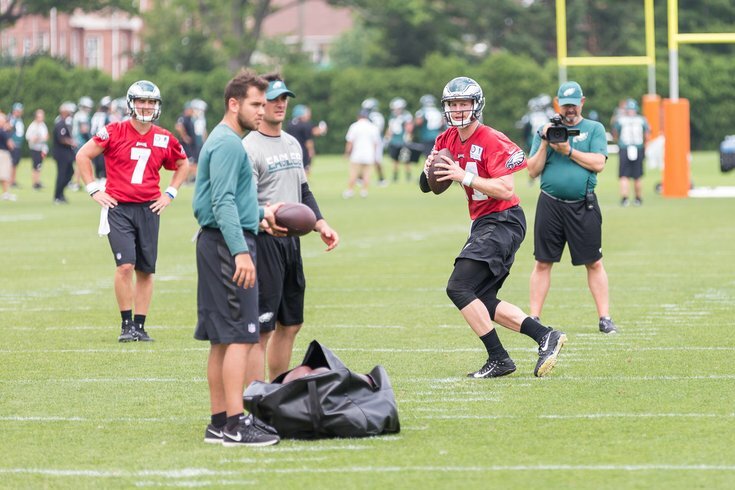 Throughout OTAs and minicamp, Wentz's tendency to sail passes continued. He has to fix that, and soon. The Eagles spent a lot of money on their backup quarterbacks over the last two seasons. Chase Daniel ate up $5 million in cap space in 2016, and he'll count for $6.1 million in dead money in 2017 following the Eagles' decision to release him this offseason. Daniel did have one pass attempt that he completed for 16 yards though, so maybe it was all worth it. Meanwhile, Foles signed a new two-year deal worth $11 million. That's a lot of money wrapped up in two backup quarterbacks. While there's certainly a great argument that the Eagles mishandled their backup quarterback situation over the last two years, money-wise, there's little question in my mind that Foles is a significant upgrade over Daniel. While Daniel doesn't have much of a resume in actual games, I did get to see him in training camp every day for a month, and obviously, as everyone saw, his play in the preseason was uninspiring. Foles' name is now tainted after a bad tenure with a horribly run Rams team, but in my view, he's an excellent backup, and there's an argument to be made that's he's better than a very small handful of quarterbacks that will start Week 1 this year. There's some good, some bad above, but Foles is clearly a quarterback you can win games with in a pinch. Should the Eagles need him at some point, he'll be in an offense he already knows, and should be able to provide competent QB play. With Wentz and Foles ahead of him, McGloin will be the Eagles' third quarterback, at best. Around half the teams in the NFL only keep two quarterbacks. The Eagles themselves were one of those teams a season ago, when they only kept Wentz and Daniel after trading Sam Bradford. McGloin is essentially competing against himself and the Eagles depth in general for a roster spot. Is there a camp battle to watch at QB? Nah. Obviously, Wentz is the starter, and Dane Evans is a camp arm. If you really, really squint hard enough (or if you're just a Penn State alum), maybe you can see a camp battle (I disagree that it even is one) between Foles and McGloin. Barring some unforeseen amazing play from McGloin in camp, the depth chart is very clearly Wentz-Foles-McGloin-Evans.